Ms Livni received a letter from the police on Thursday but the summons was cancelled after talks between Israel and the UK, Israeli media reports say. The case relates to the 2008-9 conflict in Gaza, when Ms Livni was foreign minister and deputy PM, they say. UK police said there was no ongoing war crimes investigation. Correspondents say pro-Palestinian activists have filed a series of complaints against Israeli officials, including Ms Livni, in recent years. An arrest warrant for Ms Livni was issued in the UK in 2009, triggering a diplomatic row between the two countries. 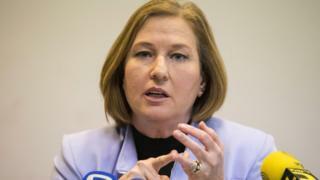 Ms Livni cancelled her visit. In 2011, UK law was changed to make it more difficult to obtain arrest warrants for Israeli public figures visiting in an official capacity. On this occasion, Ms Livni - now a Knesset member for the centre-left Zionist Union - visited the UK to participate in a conference organised by Haaretz newspaper and the British Jewish community. The summons was "on a voluntary basis" and by consent, a senior Israeli official quoted by Haaretz said. The questioning was to have been about suspected war crimes and violations of the Geneva Conventions during the 2008-9 Operation Cast Lead in Gaza, the newspaper added. The operation, involving Israeli air strikes and a ground invasion in response to rocket attacks on southern Israel, led to almost 1,400 Palestinian and 13 Israeli deaths. Urgent diplomatic contacts were made between the two countries, which resulted in Ms Livni being given diplomatic immunity and declining the invitation to questioning. In a statement, the Israeli embassy in London expressed its concern about the request for an interview. "Israel stands shoulder to shoulder with its global partners - including the UK - in both its commitment to the rule of law and its ongoing fight against the threat of terrorism and extremism," it said. "It would expect that those sharing this commitment act to prevent the abuse of their legal system for political ends and to confront attempts to draw a moral equivalence between those perpetrating terror and those fighting against it."